1, According to demand, such as the use of cable seals, etc., choose the material of the cable seal. 2,To ensure that the application is compatible. If passing the cable through one hole, at least 10% of the cable thickness change is allowed. For example, for a 1.5 mm cable, the diameter of the hole must be at least 1.65 mm. Insufficient clearance can result in loosening of both ends of the cable, affecting the insertion of the cable into the locking mechanism. The available cable length for locking is usually 2 inches shorter than the actual cable length because the cable is tapered. 3, Pricing considerations. Normally shorter, thinner cable costs will be lower, if simply to reduce costs will choose short and thin cable seal. However, full consideration should be given to safety requirements to choose a more cost effective seal. 4,Safety. All cable seals have a unique serial number. Record the serial number for added security. 5, Industry compliance. Cargo crossing international borders usually require a highly secure seal as identified by ISO 17712. 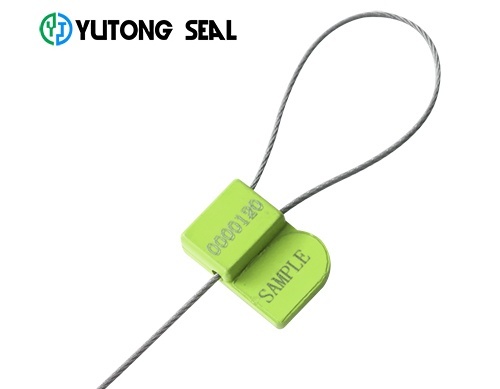 In order to meet the high safety standards of ISO 17712: 2013, the cable seal diameter must be at least 3.5 mm; this is the cable diameter required to pass the ISO 17712 shear test. 1,Improved locking mechanism to prevent tampering. 2,The bar code with a unique serial number to match, in order to improve productivity. 3, Lightweight (but durable) construction, in order to minimize shipping costs. 4, Cable seal is also configured to length adjustable or fixed length.